Meet our September Patient of the Month, Izabella. Growing up, Izabella was a very active child; from soccer to baseball, she loved to play outside. One day, her dad noticed her limping after a soccer game. Later on at home, he took a closer look at her leg and noticed that her knee was swollen. They brought her to Nicklaus Children’s Hospital (formerly Miami Children's Hospital), where she received an MRI. When the results came back, Izabella's parents were told the dreadful news - she had osteosarcoma. Bone cancer. After starting chemo at Nicklaus Children's Hospital, Izabella underwent surgery to remove the bones affected by the cancer, which included her knee and part of her femur. An extendable prosthesis was placed in her leg, which will allow her leg to grow at the same rate as the other. She is now recovering from her treatment and going to therapy to be able to start walking again. This week, Izabella (who's quite the fashionista) will walk the runway at the 4th Annual Fashion Gives Back, an event created by Miami Children's Young Ambassadors (MCYA) that helps raise funds and awareness for Miami Children's Health Foundation. Moreover, September is Childhood Cancer Awareness Month and according to the American Cancer Society, more than 10,000 U.S. children under the age of 15 will be diagnosed with cancer this year; approximately 1/4 of them will not survive the disease. 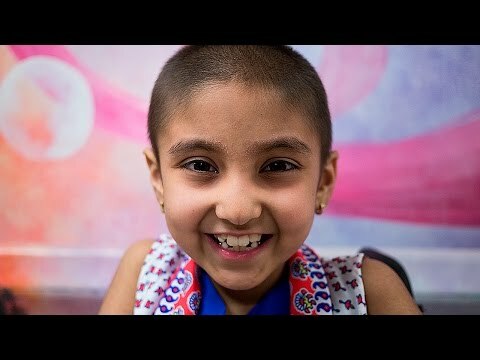 To help children like Izabella and assist in the fight to end childhood cancer, please visit www.mchf.org/donate.